Once we started measuring for a custom cage we realized that our measurements were coming out pretty close to what the S&W CRX cage would be. We had initially assumed that the main hoop would sit in the rear passenger footwell and that the S&W cage would be too short. The big Ah-Ha came when we pushed the main hoop back far enough that it sat on the rear seat. This is what the S&W cage was built to do, so it looks like it will fit pretty close. 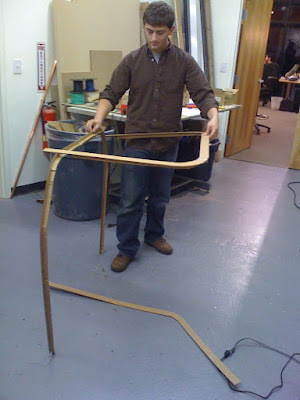 We traced the design on a cardboard mockup and test fit it to the car. Looks like it will fit up fine. The extra nice side is that the cage is cheaper than I thought. It's built out of .134 EWS rather than .120 DOM, so it costs about half as much.